At this point the shop is located in the basement of my house. Its past two locations were in studio lofts in downtown buildings, but I bought a house two years ago and it's been in the basement ever since. Here is my old studio loft. The old shop had a great view of downtown. 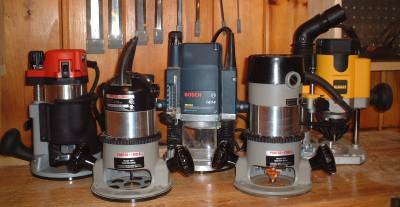 Do you really need all of the tools in your shop? I regularly use all of the tools you see in the pictures, but do I need them? Probably not, but the quality of my work improved as I acquired more tools. Draw your own conclusions. Which Tools Should I Buy First? That�s a hard question to answer because it all depends on what kind of work you plan to do. You can do a whole lot with a table saw, jig saw, cordless electric drill, miter saw, handheld orbital sander, and drill press. For a more ambitious sized shop I'd suggest a mid-size table saw with sliding cutoff table, compound miter saw, drill press, miter saw, jointer, Performax 16-32 sander, 14 inch band saw, cordless electric drill, two horsepower plunge router, router table, hand held orbital sander, one horsepower dust collector, and shop vacuum cleaner. That�s just a suggested list that seems right for some common tasks. Depending on your needs, you might also want a planer, scroll saw, lathe, shaper, or radial arm saw, and you might want a cabinet style table saw instead of a contractor saw. Which tools do you recommend? Here are some observations based on my own personal experience. These are my experiences, and yours may be different, so don't treat my words as the Gospel truth. There are a lot of great hand power tools out there, but I think Milwaukee makes the best. There are a lot of good table saws out there right now. I bought a new one a couple of years ago, and I had a hard time choosing between Powermatic, DeWalt, and General International. I settled on the General International because, compared to the Powermatic, it was less expensive and had a larger motor. The DeWalt had received good reviews in various woodworking magazines, and I think they are excellent machines. Jet saws are also pretty good, but for about the same price you can buy the Powermatic, which I slightly prefer (due to its fence). I would stay away from the new Jet SuperSaw. The saw itself seems to be well-designed, but the fence isn't beefy enough for my taste. I found that pressing against the fence, especially on the outfeed side, caused it to deflect. Craftsman has recently updated its line. Their previous saws were not that great, but early reviews show that the new ones are much better and offer a great value for the dollar. I don't think the Delta has a very good ratio of performance per dollar and I have had some trouble with the quality of other Delta tools I have purchased in the past. 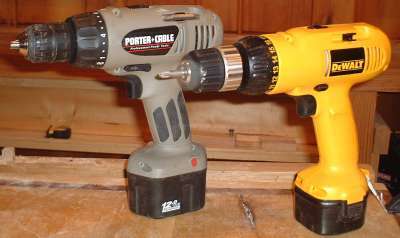 If you are looking for a bench top model you should consider the Porter Cable, Bosch, or DeWalt. I have tried a number of different table saw blades, and I�ve recently settled on the 1007740T from Oldham (a.k.a United States Saw). Prior to this, I was paying half again as much for blades that did not perform as well. Not only that, but the Oldham comes with a blade stabilizer called the T4 Silencer, which reduces vibrations and increases performance. The T4 is a freebie, but I figure it's worth twenty bucks or so. 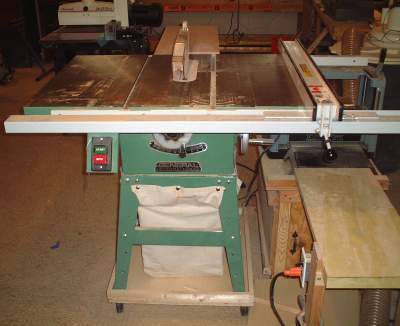 My radial arm saw is also outfitted with an Oldham blade, the United States Saw Woodworker's Signature 60 tooth premium radial arm saw blade. The Delta blade that came with the radial arm saw was horrible. It was warped out of shape (due to the fact that he arbor nut had been overtightened at the factory), and I�m not sure if it would have been okay under normal circumstances. The United States Saw blade made a dramatic improvement. If you have a contractor saw, changing to a link-type belt will substantially reduce the vibration on your saw and probably prolong the life of the bearings on both the saw and the motor. Installing a zero-clearance insert will give you better results and it made my saw run more quietly. Replacing the miter gauge that comes with the saw with something a little better (I like the Incra Miter 1000) is a step in the right direction, but if you do not own a radial arm saw and do not plan to buy one you might consider adding a sliding miter table. I like Bosch, Milwaukee, DeWalt and Porter Cable routers, and the final choice comes down to application and personal preference. My favorite plunge router is the Bosch 1613 AEVS with the DeWalt DW 621 running a close second. Reviews in the June 2001 issue of Fine Woodworking and the June/July issue of Wood magazine also gave top honors to the Bosch with a DeWalt just behind it. The Milwaukee Body Grip fixed base router is by far my favorite. It's what I use in my router table, and it's my father's only router. I already own two, and I plan on buying at least one more. The Oldham company, which manufactures the saw blades I use, also makes router bits. Fine Woodworking tested 17 popular router bits, and the Oldham Viper came in third, way ahead of some much more expensive bits and not too far behind the top two in terms of actual performance. Unlike the top-ranked other bits, which can only be obtained though mail order companies, the Viper is available in home centers. That means that I don�t have to pay shipping, not to mention the fact that the Viper is less expensive in the first place. Oldham router bits, like their saw blades, are made in the USA. 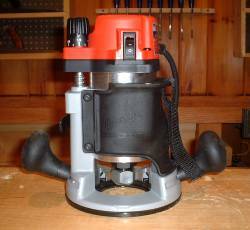 I have a Bosch router table with optional stand that I really like. Porter Cable and DeWalt deliver good bang for the buck, but for heavy-duty use you can�t beat Milwaukee. For a thickness sander there is no contest - I strongly prefer Performax to either Delta or Ryobi. DeWalt, Delta, and Porter Cable make some nice miter saws, and it's worth the extra money for a twelve inch model. I prefer the Delta radial arm saw to the Craftsman or Rigid, and good luck finding one made by another manufacturer. If you use a hand plane only for rough work (knocking off rough edges before finishing up on the jointer or cleaning up glue joints) then buy an old Stanley Bailey on eBay. If you want to do finishing work, consider a Lie Nielson or Clifton. Upgrading an old hand plane with a really good blade and a Clifton two-piece cap iron will do wonders, but a Clifton cap iron might not fit every hand plane. What do you think about your Shopsmith? Should I buy one? The Shopsmith is a misunderstood tool, even among Shopsmith owners. If you want a shop full of tools but don't have room for a shop full of tools, if you're the kind of guy who likes Swiss Army knives, or if something about the Shopsmith just speaks to you then maybe it's the tool you need. It's also a good tool for a person who moves a lot - it's easier to transport a Shopsmith than a whole shop full of machines. 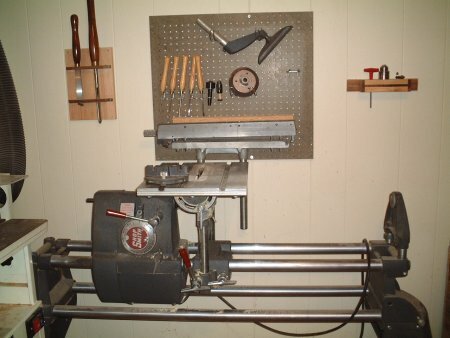 I like my Shopsmith because I am running out of room and it does the work of several machines (lathe, horizontal boring machine, wood buffer, large drill press) without taking up a lot of shop space. For more information, check out this page in my Shopsmith Tips section or the Shopsmith company website. For general woodworking where there is lots of surface area I use good old Elmer�s white glue. Today�s woodworkers seem to forget that for several decades it was the glue of choice and that the projects built in that era are still holding together. Yellow glue replaced Elmer�s in the hearts of woodworkers. It is more resistant to water (although not waterproof) and has good bonding strength, but it has a severe dulling effect on tools so be careful if you�re going to machine glued joints. It is the glue I use for building musical instruments and places where there is not much surface area or a need for extra strength. My favorite yellow glue is Probond interior wood glue, which is also made by Elmer�s Products. Polyurethane glues (like Gorilla glue) have come onto the scene recently. They are expensive, the whole bottle gets ruined if you forget to put the cap back, they have a relatively short shelf life, and they stain your hands. Yes, they are waterproof, and yes, the squeezed out glue is easy to clean from joined surfaces, but those reasons aren�t enough to make it my glue of choice. For a second opinion about glues, visit JoeWoodworker.com. Which finishing method/product is best? I use of lots of different finishes, depending on the project. However, if you�re looking for an easy finish that almost always works I have a couple of choices. Two or three coats of tung oil, applied with a rag and allowed to dry about a day between coats, is about as easy as it gets. I commonly use a shellac and wax finish. The first coat of shellac is put on very thick with a rag or brush and then the excess is wiped off with a rag. This will seal in any impurities and levels off the finish. The shellac with raise the grain, so I sand with 320 grit paper. This is followed with another coat of shellac. The second coat will dissolve the first so it�s difficult (for me, anyhow) to apply the second coat with a rag, and I find an airbrush (I use a Paasche) works well for the second coat. I wet sand this coat with 1500 grit, then apply a third coat, also with the airbrush, and this is also wet sanded. At this point I use 0000 steel wool to apply a coat of paste wax, which I let sit for about 10 minutes or until it hazes over, and then I buff the finish with a cotton rag. Depending how it turns out, I will sometimes put on a second coat of wax. I have recently started using the Beall Wood Buff system, which can be used alone, but seems to work best over another finish. I had an almost-but-not-quite perfect wax and shellac finish on a banjo neck that I built a few years back (nice finish, but reflected light unevenly in a few places.) The Beall system did a great job of bringing the neck to a consistent luster. Where can I learn more about woodworking? Here are some resources that I have found valuable. I enjoy both programs. I have met Scott Phillips a number of times at various woodworking shows and he is a heck of a nice guy. You can purchase tapes of New Yankee broadcasts and measured drawings of project at the New Yankee website. How did you get started building banjos? The original inspiration for my woodworking was my father. He was (and still is) a pretty handy guy, and I used to follow him around on various building projects. 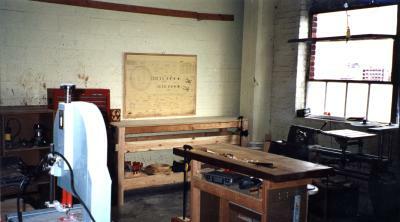 He had a pretty nice woodshop in the basement (with an original ShopSmith 10ER) and that gave me the interest. I had been thinking about building a banjo for quite a few years but I really didn�t know how to get started. A father of a former girlfriend who was a part-time luthier filled in some important blanks, and about a year later I built my first banjo. Can you build a guitar or banjo for me? I can, but it doesn't make much financial sense. Big companies buy their parts in large quantities at a very low cost, and they have streamlined the building process so that instruments can be built quickly. 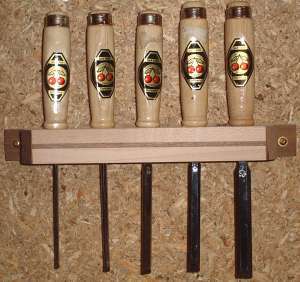 I pay much more for component parts, and my instruments are hand built one-at-a-time, which is a pretty slow process. Even if I only charged fifty cents an hour for my labor, it would still be cheaper for you to buy an instrument from a major manufacturer. This is the New Golden Age of instrument making, and there are so many great builders out there it is hard for me to pick only a few. Excellent banjos are being built by Sullivan, Stelling, Fawley, Reiter, Deering, Wildwood, and Gibson. Marty Lanham, a custom builder, made my all-time favorite banjo, the Gibson Florentine copy that Steve Martin used in his stand-up comedy act. C.F. Martin, America's oldest instrument builder, makes great guitars-I have one (000-16 RGTE) and I love it. My best friend has had great luck with Gibson guitars, both with an acoustic (a J 200) and an electric (a SG). Where is the best place to buy an instrument? It's always best to play whatever instrument you buy, so I suggest you find a dealer within driving distance of your home. If you're close enough, check out Elderly Musical Instruments in Lansing (Michigan), Janet Davis in Bella Vista (Arkansas), and First Quality in Louisville (Kentucky). The website was created by my web designer and me. From the beginning we had pretty much the same vision of what it should be, so it was a pretty easy task. I took most of the pictures and wrote the text, and she came up with the basic design and wrote the lines of code. Why can't I find your name on the website? This is the most frequently asked question, and it surprises me because I honestly didn't think anybody would even notice that my name is not on the site. I thought it over, and because the shop is in the basement of my house I decided it would be best to keep my name (and, therefore, the location of the shop) off the Internet. Actually, my first name (Dan) is on the website in a couple of places.